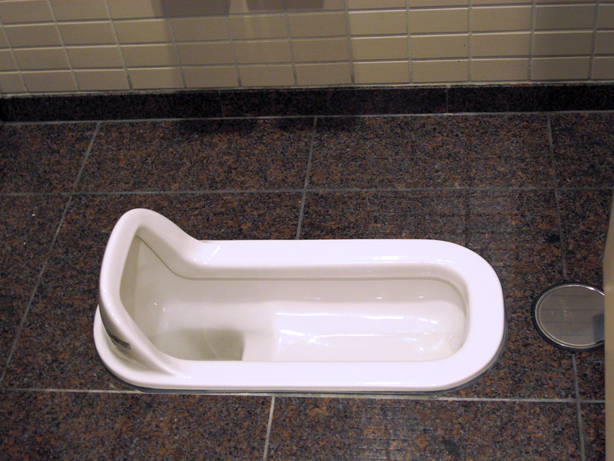 Takeaway: Humans were not meant to sit on toilets while doing #2, but rather “squat in a field.” The modern toilet aka porcelain throne aka poo bucket forces our bodies into a position that is not optimal for doing our business. Growing up, my family and I would sojourn to Korea every other summer to spend time with our extended family. I have very fond memories of hanging out with my grandparents in their home near the rice fields, catching frogs and sleeping with mosquito nets and those coils. A not-so-fond memory was the outhouse at our grandparents’ home. They didn’t have a “modern” bathroom with a porcelain toilet – the outhouse, which was a stone throw away from the main house, was a hole in the ground. A big, stinking hole. To us 3 granddaughters visiting from the U.S., going to the bathroom was a nightmare. And forget about middle-of-the-night bathroom trips, we held it. One summer, our grandfather, being the resourceful and awesome man that he was, built a spanking brand new American-style bathroom for us. The bathroom was beautiful, blue tile with a sink and sparkling white porcelain toilet. Side note, my grandparents still used that outhouse and the new bathroom went largely unused when we weren’t visiting. You can try this position yourself by 1) going to your backyard, digging a hole and doing your business or 2) purchasing a “health squat” device for $63. Either way, you may be warding off cancer! excess strain! Chron’s disease! and more! Good luck. « Daily Smart Fact #27: Cranky, Overweight, or Tired? There’s an easy remedy for that.